What Is the Biggest Wolf in the World? The gray wolf takes top honors as the largest wolf extant in the world. This imposing creature stands from 26 to 32 inches tall at the shoulder and can extend as long as six feet from nose to tail. 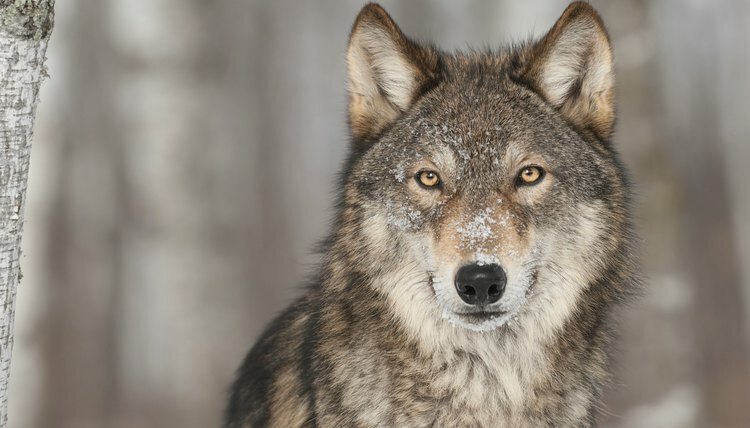 The heaviest wolf on record tipped the scales at 175 pounds. Males outsize the females, and the largest individuals live in northern latitudes. The scientific name for the wolf is Canis lupus. Other local names for this species are the timber wolf, western wolf and true wolf. The gray wolf can sprint up to 38 miles per hour and can sustain a long-distance clip of 5 mph. Its mouth is crammed with 42 teeth that can clamp down with a pressure of 1,000 pounds per square inch. Their gray coat can be mixed with brown, white, red or black. You can recognize a gray by its short ears, bushy tail, narrow chest and oversized paws. Gray wolves are carnivores, and can devour up to 22 pound of meat in one sitting. They favor deer, elk, and boar, but will not turn down beef or lamb. The gray wolf's typical lifespan ranges from 6 to 13 years in the wild, and up to 17 years in captivity.